Fully equipped polycanvas picnic backpack with blanket for two people. 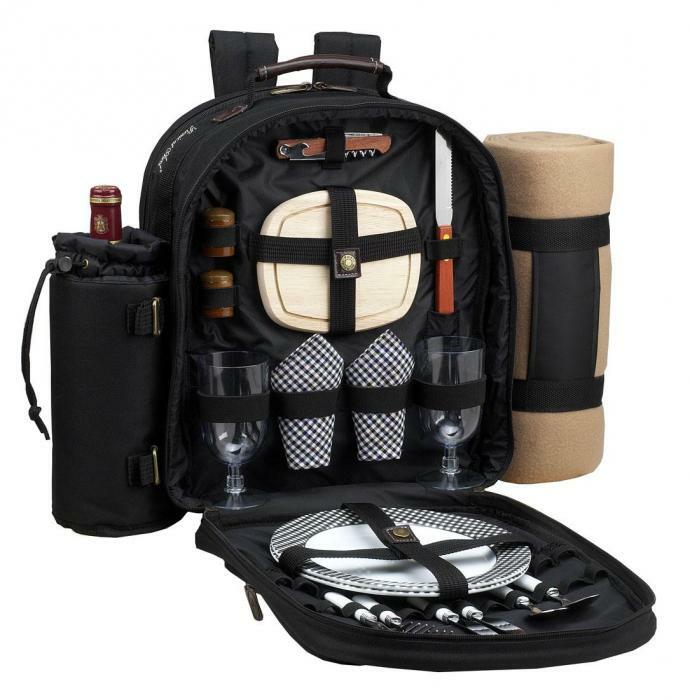 Contents include combination corkscrew, hardwood cutting board, cheese knife, wooden salt & pepper shakers with non spill tops, acrylic wine glasses, coordinating 9" melamine plates, stainless steel flatware, cotton napkins and large fleece blanket with carrier. 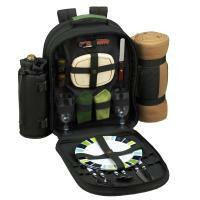 It also includes a detachable wine holder and Thermal Shield insulated cooler compartment. Lightweight, easy to carry.600D polycanvas. This classic picnic pack makes a wonderful wedding gift. Designed and assembled in the USA. Lifetime warranty. I bought this as a gift for my son to take on dates. The backpack fits his adventurous personality. I bought picnic BASKETS for my other children, but he may have felt differently about carrying a basket. The backpack is well made and has all the trimmings. Just pop a bottle of wine in the wine holder and some crackers and cheese, and you've got a last minute picnic! 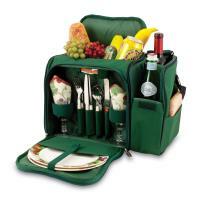 The Picnic backpack was purchase by a group as a wedding gift for a co-worker. It exceeded our expectations!! This was a bridal shower gift for my niece, she loved it. The quality was great and was very nice looking. A great picnic backpack. Has plenty of room to hold everything you need. Took it out to a state park the other day for it's first test and it worked very well. For 2 people it is perfect and I recommend this backpack to anyone in the market. 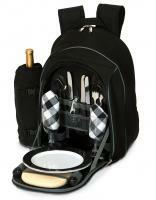 This Picnic backpack will hold everything you could possibly want to take on your picnic and more. The detachable wine bottle compartment and blanket are a great plus when less is more. 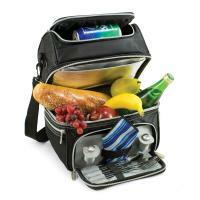 This Picnic Pack won't weigh you down and fits nicely on any body shape. Whether you are going on a day hike, spending the day at the beach or taking the family to an amusement park, this is the only pack you will ever need.